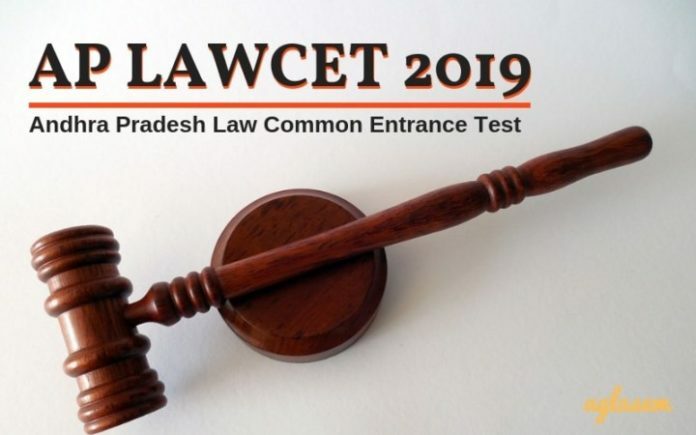 AP LAWCET 2019 – Andhra Pradesh Law Common Entrance Test (LAWCET) will be held on May 06, 2019, for admission in LLB (3 yrs and 5 yrs) in academic session 2019-20. Sri Krishnadevaraya University, Anantapuramu shall conduct the AP LAWCET exam on behalf of APSCHE. Eligible aspirants can apply online at sche.ap.gov.in as per schedule. Check here complete details of AP LAWCET 2019 including exam date, apply online, online application form, exam pattern, syllabus, admit card, result, cut off. Latest: Application Form for AP LAWCET 2019 has been released. Scroll down to apply for the same. 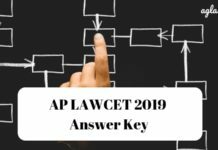 AP LAWCET 2019 is a state-level law entrance exam. APSCHE usually gives the responsibility of conduct of AP LAWCET exam to Sri Krishnadevaraya University. Eligible law aspirants can submit the online application form in online mode by paying an application fee. Candidates must do registration as per schedule is given below. Provisional Answer Key And Response Sheet To be announced! Courses offered are 3 year LLB and 5 year LLB. There is a common entrance exam for both. Read on to know complete details of common entrance test. Candidates should fulfill eligibility criteria in order to be eligible to appear in exam and get admission on basis of it. Details of AP LAWCET 2019 eligibility criteria are as follows. Candidates must have passed any graduate degree (10+2+3 pattern). Their marks should be at least 45% in aggregate. Those who have marks less than 45% in graduation, should have passed any additional graduate or post graduate degree with 45%. Candidates must have cleared class 12 or equivalent. Their marks should be at least 45% in aggregate. However there is relaxation of 5% for SC/ST candidates. There is 3% relaxation for OBC candidates. Age limit shall be as per rules decided by concerned authorities at time of admission. They should also satisfy local / non local status requirement as per Andhra Pradesh Educational Institutions (Regulation of Admissions) Order, 1974 and the amendments made thereto from time to time. Convener of LAWCET exam or/and Common Entrance Test Committee reserves right to reject candidature at any stage. Candidature is rejected if either AP LAWCET 2019 application form is incomplete, or, candidate fails to satisfy prescribed eligibility criteria, or he/she has provided false or incorrect information in form. If you have made up your mind to apply online for AP LAWCET 2019, then you should keep mandatory details ready. Also, take note of optional entries that you need to fill in the online form. It is important to keep in mind that AP LAWCET 2019 and AP PGLCET 2019 share same application form. Therefore candidates should select the correct exam while filling the form. Exam conducting body shall not be responsible for the selection of incorrect exam. Exam conducting body is also not responsible for non submission of AP LAWCET 2019 Application Form by last date for whatsoever reason. Those who fill and submit the application form with a fee on time can download admit card as per schedule. Important things to know about it are as follows. APSCHE / SKU issues admit card to applicants only. Mode of issuance of AP LAWCET 2019 Admit Card is online, at sche.ap.gov.in. Candidates can download AP LAWCET 2019 Hall Ticket by logging in to download hallticket page. Here they have to enter payment reference ID, registration number, qualifying examination hall ticket number, mobile number, date of birth. On exam day, it is compulsory to report by reporting time mentioned in hall ticket. It is advisable to practice mock tests on the official website to familiarize with an online test. 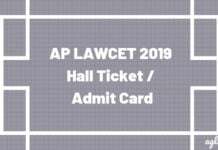 The AP LAWCET 2019 will be held on the 06 May 2019 at 2:30 pm to 4:00 pm. Exam pattern of AP Law Common Entrance Test is as follows. Candidates will be required to prepare for 3 major sections – General knowledge and mental ability, Current affairs, and Aptitude for the study of law. The important topics from each of these sections have been mentioned below. Current Affairs – In order to prepare well for this section, a candidate is required to keep themselves updated with trending topics and the current events around the world and India, in general. Study Of Aptitude of Law – This section will usually have questions from law section to test the legal aptitude of the candidates. Candidates can appear in that exam centre only which is assigned to him/her. However, at the time of filling AP LAWCET 2019 Application Form, candidates can select some preferences. APSCHE / SKU hsa announced the exact list of cities where there will be exam centres with notification. Anantapuramu, Chittoor, Tirupathi, Kadapa, Kurnool, Nandyal, Nellore, Ongole, Guntur, Vijayawada, Bhimavaram, Kakinada, Rajamahendravaram, Visakhapatnam, Vizianagaram, Srikakulam. AP LAWCET 2019 Answer Key will be officially issued by exam conducting body only. However, there are chances that some law entrance exam coaching centre may also issue answer keys right after the exam. So candidates can therefore first refer to unofficial answer keys to get an idea of answers, and then later refer official answer to know exact answers. Also law aspirants can make use of social media and forum to discuss memory based question answers. Since LAWCET AP 2019 will be an online exam, therefore exam conducting body will most likely give facility to check response sheet. Response sheet refers to submitted responses or answers of candidates. For example, if one had marked option a in question number 1, then response sheet shows that you marked option 1 in question number 1. Candidates will be able to check response sheet by accessing the login link for it, which will be available, from official website before the result. Another good thing is that they may also get a chance to challenge them if they think there is any error. Evaluation – Exam conducting body shall take complete care to ensure that checking of all papers are correct. There are careful processes involved in the evaluation, checking, scrutiny, tabulation, ranking. Therefore SKU/APSCHE shall not accept any requests for retotaling or revaluation. 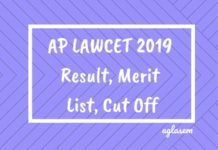 Ranking –The Candidates will be ranked in the order of merit based on the marks obtained in the AP LAWCET-2019 / AP PGLCET-2019. Tie-breaking – Wherever there is a tie, tie breaking process is implemented. For this, marks in part C of the exam are given priority (candidate with higher marks in part C gets better rank). Then marks in part B get priority. If the tie persists then both candidates get the same rank, however, one who is older may get preference for admission. Candidates are requested to note that AP LAWCET 2019 Result shall be valid only for admission in academic session 2019-2020. It is necessary to obtain qualifying marks (cut off) in order to qualify LAWCET. Cut off marks are 35% that is 42 marks out of 120. However, there are no cut off marks for SC/ST candidates. Candidates (other than SC/ST) will only get a rank if they obtain qualifying marks. Also, keep in mind that mere appearance in exam does not guarantee admission. Another key point is that if a candidate has claimed cut off relaxation as SC/ST, but he/she cannot give documentary proof of belonging to category, then his/her candidature will be cancelled. Admission to LLB (3 yrs) and LLB (5 yrs) program is on basis of merit obtained in AP LAWCET 2019. As per the last year details, Colleges, where admission will be offered on basis of AP LAWCET, are as follows. A candidate qualifying for AP LAWCET 2019 shall be eligible for admissions to any of the following member colleges. Official website of AP LAWCET is sche.ap.gov.in.